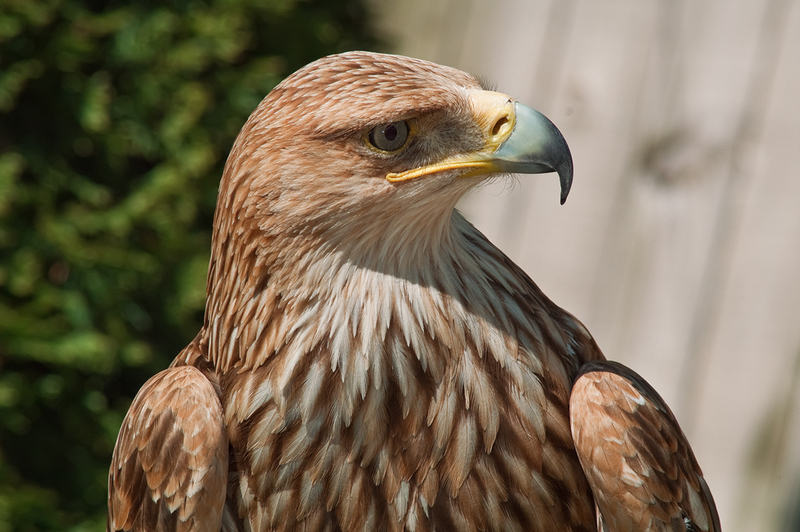 For bird enthusiasts and passionate animal lovers here is this Golden Eagle specimen. There was a very similar image in Barcelona Photoblog in the past but I could not resist publishing a second shot. Maybe it has happened to you that you visit some place, take a good series of pictures of the same subject hoping to catch that special moment and just a couple of them out of ten completely satisfy you, perhaps even just one. Then you get home and for some mysterious reason choose the wrong shot to use in your post. Well, sometimes those forgotten images well deserve a second chance. Whatever the final choice is, this is a magnificent animal and you could admire her too if you visit Cim d'Aligues (Eagles' Peak). Note: Members of Cim d'Àligues' page on Facebook have made this important clarification: 'It's not a golden eagle, it's a young Eastern Imperial Eagle (Aquila heliaca)'. Thanks so much for correcting my mistake! I saw one here in Los Angeles last weekend. He evidently had a little fight with a squirrel and they both feel out of a tree. With his tremendous wingspan he simply took to the air and was gone in two seconds. It is a very good idea to post this second picture… because I had not seen the first one. And it is a beautiful portrait indeed. A glorious shot, Carlos. What a beauty! I have seen birds of prey at work in the Portland Zoo but I don't think any of them were goldens.